There are many reasons why homeowners might consider painting vinyl windows. The number one reason is that they want to change the color without replacing all the windows. While vinyl can be a low-maintenance, energy-efficient window option, you may not be able to find the frames in a specific color, or you may notice the color fading over time. But, can you paint vinyl windows successfully and safely? 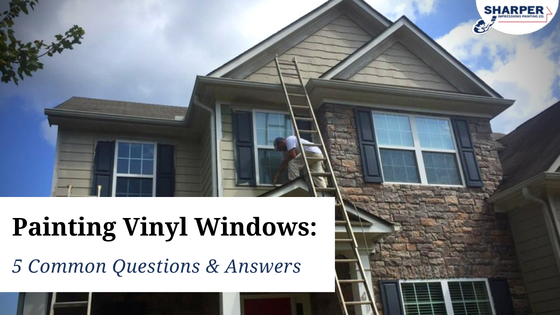 If you’re looking for answers to your questions about painting vinyl windows and trim, the following information can help. 1) Can you paint vinyl windows? If you think you’re stuck with white vinyl windows for the long haul, think again! You can paint vinyl windows to add a pop of color to your home and give it more curb appeal. The process of painting vinyl windows can be completed successfully if done by professional house painters who know how to use the proper tools, paints, and techniques. Professional painters use specific primers and specially-formulated paints for vinyl to ensure each coat goes on smoothly and the color lasts a long time. 2) Can you stain vinyl windows? Unfortunately, you can’t stain vinyl windows. You can only paint vinyl with a solid color. 3) Can you paint interior vinyl window trim? Once your exterior vinyl window frames have been painted, you may wonder if you can paint the inside of them, as well. The good news is that yes, you can paint interior vinyl window trim. In fact, our interior trim painters recommend you do this if you want your windows to look great from either side. Whether you’re looking to sell your home, or just want everything to look cosmetically pleasing, adding color to your interior window sashes is a good idea. Tip! Always avoid painting the inside tracks of vinyl windows. Because vinyl windows close so tightly, painting the inside tracks can cause sticking when you open and close them. 4) Can you paint vinyl windows black? Sometimes. While black window trim can add a sophisticated touch to a home, the major concern of many paint companies is that too-dark paint can cause warping from the sun. Most vinyl-safe paint is specially-formulated to prevent this from happening, but not all vinyl-safe paint brands will offer black or darker color options since warping can still be a concern. Always talk to your professional painting company about any questions you may have about dark vinyl-safe paints to make the best decision for you and your home. 5) How long does paint last on vinyl windows? While many factors can affect how long paint lasts on vinyl windows, painted vinyl typically can last 10 years or more. The paint finish should last a long time if the windows are painted correctly and you properly maintain them. Choose the right color. Choosing which color of vinyl-safe paint is no easy feat. For one, once you go dark on vinyl, it can be difficult to go lighter again. Ensure that you’re picking the right paint for your vinyl windows by getting expert advice from a color consultant during an in-home paint color consultation. Hire professional house painters. Painting vinyl windows is a difficult task that you shouldn’t undertake unless you are a professional painter yourself! Hiring experienced house painters will give you peace of mind knowing that your windows will be properly protected, prepped, and painted for maximum paint color longevity. Clean your vinyl windows. If you don’t want to paint, you can revive your vinyl windows with special cleaners that will remove the oxidation and restore a slight sheen to them. This is a temporary solution as the color will fade again in the future. But it’s a cost-effective way of making your vinyl windows look close to new again. Whether you just replaced your old aluminum window frames with vinyl and want to change the color, or simply need to refresh your window trim with new paint, our professional house painters are available to help. Our team is highly-skilled in all aspects of house painting including vinyl window painting, and use only the best techniques, tools, and vinyl-safe paints to ensure that the finish on your windows looks beautiful and last for many years. If you’re ready to paint your vinyl windows, contact us for your free house painting quote today!